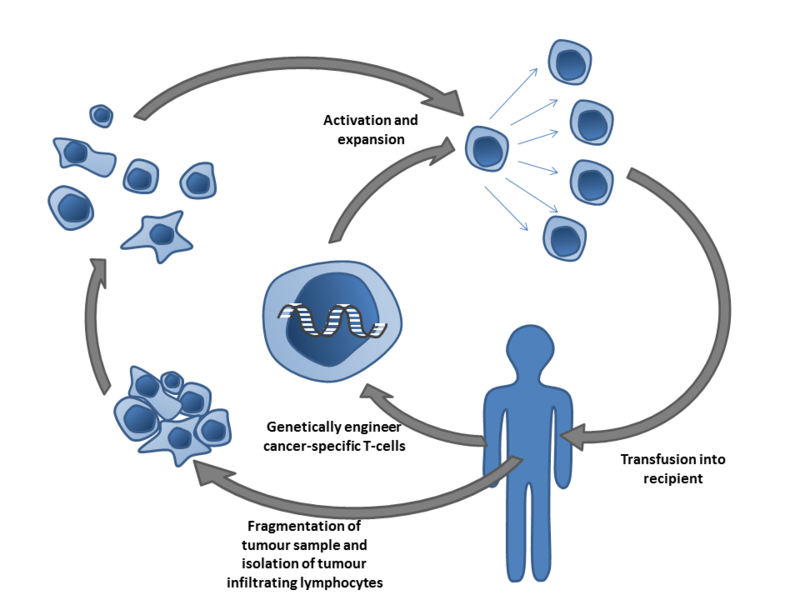 The aim of this post is to illustrate how deep learning is being applied in cancer immunotherapy (Immuno-oncology or Immunooncology) - a cancer treatment strategy, where the aim is to utilize the cancer patient’s own immune system to fight the cancer. In my research, I apply deep learning to unravel molecular interactions in the human immune system. One application of my research is within cancer immunotherapy (Immuno-oncology or Immunooncology) - a cancer treatment strategy, where the aim is to utilize the cancer patient’s own immune system to fight the cancer. The aim of this post is to illustrates how deep learning is successfully being applied to model key molecular interactions in the human immune system. Molecular interactions are highly context dependent and therefore non-linear. Deep learning is a powerful tool to capture non-linearity and has therefore proven invaluable and highly successful. 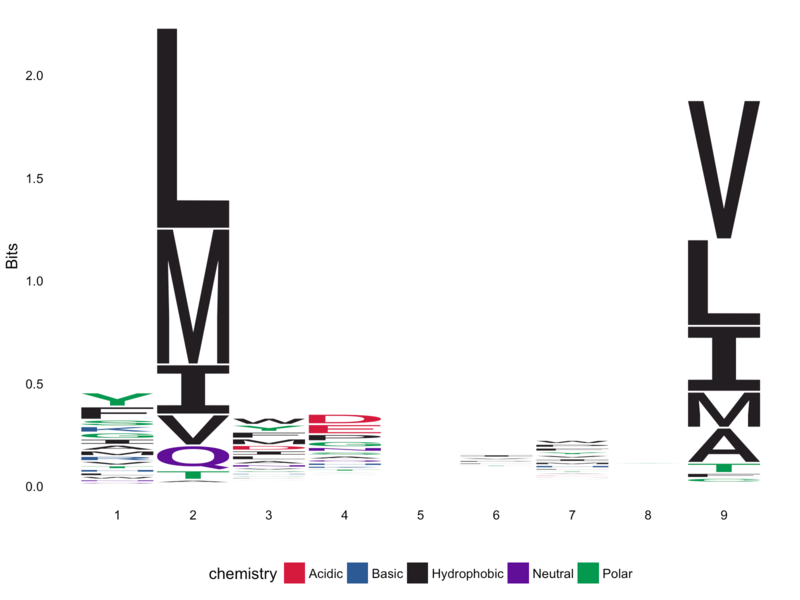 In particular in modelling the molecular interaction between the Major Histocompability Complex type I (MHCI) and peptides (The state-of-the-art model netMHCpan identifies 96.5% of natural peptides at a very high specificity of 98.5%). Some brief background before diving in. Special immune cells (T-cells) patrol our body, scanning the cells to check if they are healthy. On the surface of our cells is the MHCI - a highly specialized molecular system, which reflects the health status inside our cells. This is done by displaying small fragments of proteins called peptides, thus reflecting the inside of the cell. T-cells probe these molecular displays to check if the peptides are from our own body (self) or foreign (non-self), e.g. from a virus infection or cancer. If a displayed peptide is non-self, the T-cells has the power to terminate the cell. Adoptive T-cell therapy is a form of cancer immunotherapy that aims to isolate tumor infiltrating T-cells from the tumor in the patient, possibly genetically engineer them to be cancer-specific, grow them in great numbers and reintroduce them into the body to fight the cancer. In order to terminate cancer cells, the T-cell needs to be activated by being exposed to tumor peptides bound to MHCI (pMHCI). By analyzing the tumor genetics, relevant peptides can be identified and depending on the patients particular type of MHCI, we can predict which pMHCI are likely to be present in the tumor in the patient and thus which pMHCIs should be used to activate the T-cells. Next, we’ll dive into building the artificial neural network. If you want to a more detailed explanation of cancer immunotherapy and how it interacts with the human immune system before going further, see the primer on cancer immunotherapy at the end of the post. The input data for this use case was created by generating 1,000,000 random 9-mer peptides by sampling the one-letter code for the 20 amino acids, i.e. ARNDCQEGHILKMFPSTWYV, and then submitting the peptides to MHCI binding prediction using the current state-of-the-art model netMHCpan. Different variants of MHCI exists, so for this case we chose HLA-A*02:01. This method assigns ‘strong binder’ SB, ‘weak binder’ WB or ‘non-binder’ NB to each peptide. 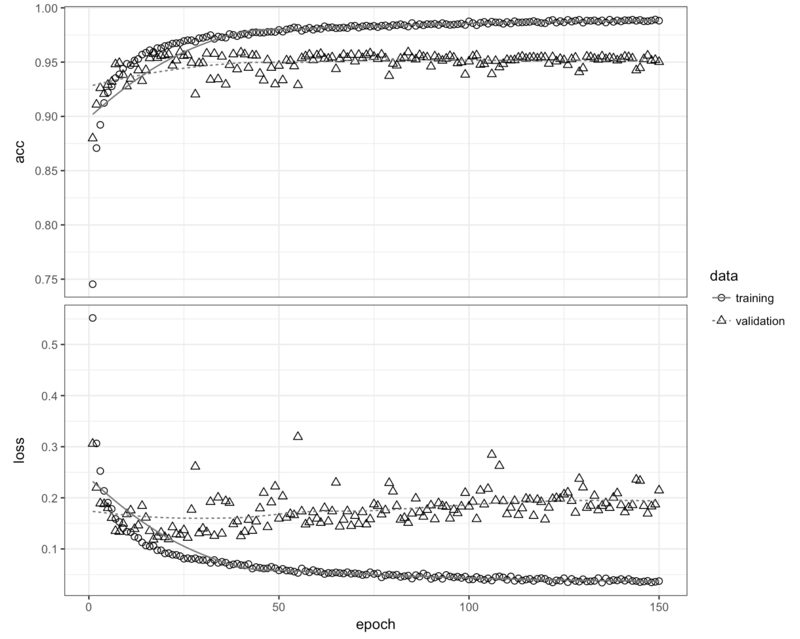 Since n(SB) < n(WB) << n(NB), the data was subsequently balanced by down sampling, such that n(SB) = n(WB) = n(NB) = 7,920. Thus, a data set with a total of 23,760 data points was created. 10% of the data points were randomly assigned as test data and the remainder as train data. It should be noted that since the data set originates from a model, the outcome of this particular use case will be a model of a model. However, netMHCpan is very accurate (96.5% of natural ligands are identified at a very high specificity 98.5%). 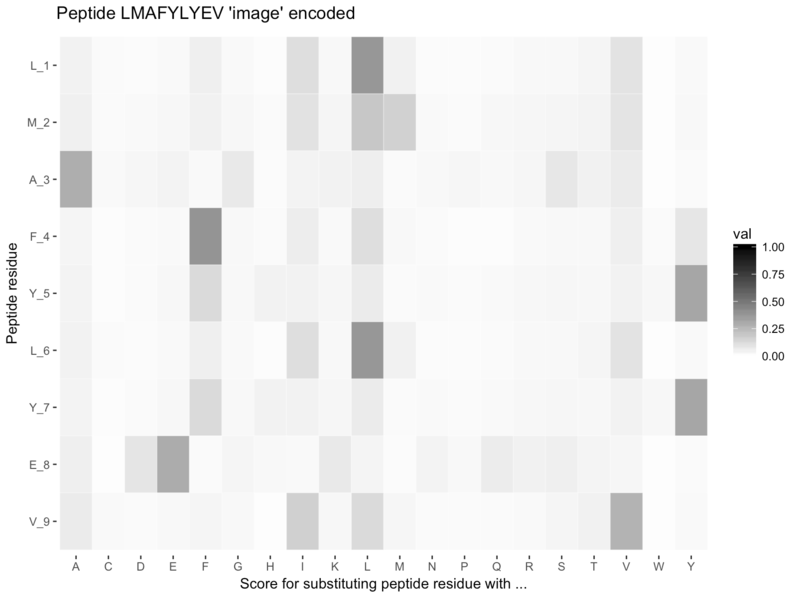 In the following each peptide will be encoded by assigning a vector of 20 values, where each value is the probability of the amino acid mutating into 1 of the 20 others as defined by the BLOSUM62 matrix using the pep_encode() function from the PepTools package. This way each peptide is converted to an ‘image’ matrix with 9 rows and 20 columns. Where peptide is the 9-mer peptides, label_chr defines whether the peptide was predicted by netMHCpan to be a strong-binder SB, weak-binder WB or NB non-binder to HLA-A*02:01.
label_num is equivalent to label_chr, such that NB = 0, WB = 1 and SB = 2. Finally data_type defines whether the particular data point is part of the train set used to build the model or the ~10% data left out test set, which will be used for final performance evaluation. From the sequence logo, it is evident, that L,M,I,V are found often at p2 and p9 amongst the strong binders. In fact these position are referred to as the anchor positions, which interact with the MHCI. The T-cell on the other hand, will recognize p3-p8. A dense layer is a standard neural network layer with each input node is connected to an output node. A dropout layer sets a random proportion of activations from the previous layer to 0, which helps to prevent overfitting. The input_shape argument to the first layer specifies the shape of the input data (a length 180 numeric vector representing a peptide ‘image’). The final layer outputs a length 3 numeric vector (probabilities for each class SB, WB and NB) using a softmax activation function. The final result was a performance on the 10% unseen data of just short of 95% accuracy. This resulted in a performance on the 10% unseen data of 92% accuracy. One might have expected the CNN to be able to better capture the information in the peptide ‘images’. There is however a crucial difference between the peptide ‘images’ and the e.g. MNIST dataset. The peptide ‘images’ do not contain edges and spatially arranged continuous structures, rather they are a set of pixels with p2 always at p2 and likewise for p9, which are determinants for binding. 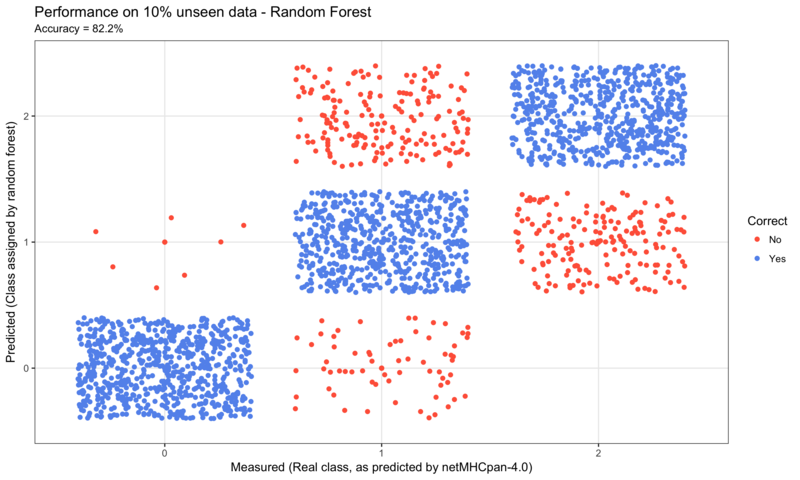 Knowing that deep ;earning is not necessarily the right tool for all prediction tasks, we also created a random forest model on the exact same data using the randomForest package. 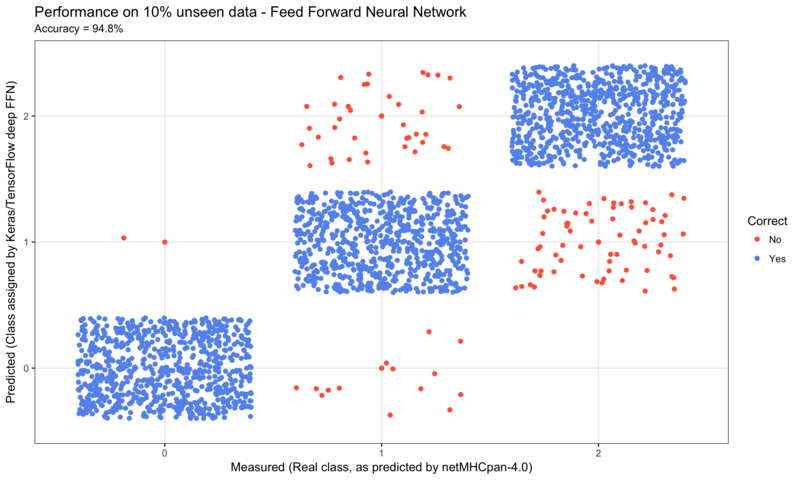 title = "Performance on 10% unseen data - Random Forest"
xlab  = "Measured (Real class, as predicted by netMHCpan-4.0)"
ylab  = "Predicted (Class assigned by random forest)"
It is evident that the deep learning models capture the information in the system much better than the random forest model. However, the CNN model didn’t not perform as well as the straightforward FFN. This illustrates one of the pitfalls of deep learning - blind alleys. There are a huge number of architectures available, and when combined with hyperparameter tuning the potential model space is breathtakingly large. To increase the likelihood of finding a good architecture and the right hyper-parameters it is important to know and understand the data you are modeling. Also, if possible include several sources of data. For the case of peptide-MHC interaction, we include not only information of the strength of the binding as measured in the laboratory, but also information from actual human cells, where peptide-MHC complexes are extracted and analysed. It should be noted that when we build models in the research group, a lot of work goes into creating balanced training and test sets. Models are also trained and evaluated using cross-validation, usually 5-fold. We then save each of the five models and create an ensemble prediction - wisdom-of-the-crowd. We are very careful to avoiding overfitting as this of course decreases the models extrapolation performance. There is no doubt that deep learning already plays a major role in unraveling the complexities of the human immune system and associated diseases. With the release of TensorFlow by Google along with the keras and tensorflow R packages we now have the tools available in R to explore this frontier. Here is an elaborated background on DNA, proteins and cancer 1. However, brief and simplified as this is naturally a hugely complex subject. Comparing with a building - if DNA is the blue print of how to construct a building, then the proteins are the bricks, windows, chimney, plumbing etc. Some proteins are structural (like a brick), whereas others are functional (like a window you can open and close). All ~100,000 proteins in our body are made by of only 20 small molecules called amino acids. Like with DNA, we can represent these 20 amino acids using: A,R,N,D,C,Q,E,G,H,I,L,K,M,F,P,S,T,W,Y and V (note lowercase for DNA and uppercase for amino acids). The average size of a protein in the human body ~300 amino acids and the sequence is the combination of the 20 amino acids making up the protein written consecutively, e.g. : MRYEMGYWTAFRRDCRCTKSVPSQWEAADN.... The attentive reader will notice, that I mentioned ~20,000 genes, from which we get ~100,000 proteins. This is due to the DNA in one gene being able to join in different ways and thus produce more than one protein. A peptide is a small fragment of a protein of length ~5-15 amino acids. MHCI predominantly binds peptides containing 9 amino acids - A so called 9-mer. Peptides play a crucial role in the monitoring of cells in our body by the human immune system. The data used in this use case consist solely of 9-mers. Inside each cell, proteins are constantly being produced from DNA. In order not to clutter the cell, proteins are also constantly broken down into peptides which are then recycled to produce new proteins. Some of these peptides are caught by a system and bound to MHCI (Major Histocompatibility Complex type 1, MHCI) and transported from inside of the cell to the outside, where the peptide is displayed. The viewer of this display is the human immune system. Special immune cells (T-cells) patrol the body, looking for cells displaying unexpected peptides. If a displayed peptide is unexpected, the T-cells will terminate the cell. The T-cells have been educated to recognize foreign peptides (non-self) and ignore peptides which originate from our own body (self). This is the hallmark of the immune system - Protecting us by distinguishing self from non-self. I the immune system is not active enough and thus fails to recognize non-self arising from an infection it is potentially fatal. On the other hand if the immune system is too active and starts recognizing not only non-self, but also self, you get autoimmune disease, which likewise is potentially fatal. Cancer arises when errors (mutations) occur inside the cell, resulting in changed proteins. This means that if the original protein was e.g. MRYEMGYWTAFRRDCRCTKSVPSQWEAADN..., then the new erroneous protein could be e.g. MRYEMGYWTAFRRDCRCTKSVPSQWEAADR.... The result of this is that the peptide displayed on the cell surface is altered. The T-cells will now recognize the peptide as unexpected and terminate the cell. However, the environment around a cancer tumor is very hostile to the T-cells, which are supposed to recognize and terminate the cell. Cancer Immunotherapy aims at taking a sample of the tumor and isolate the T-cells, grow them in great numbers and then reintroduce them into the body. Now, despite the hostile environment around the tumor, sheer numbers result in the T-cells out competing the tumor. A special branch of cancer immunotherapy aims at introducing T-cells, which have been specially engineered to recognize a tumor. However, in this case it is of utmost importance to ensure that the T-cell does indeed recognize the tumor and nothing else than the tumor. If introduced T-cells recognize healthy tissue, the outcome can be fatal. It is therefore extremely important to understand the molecular interaction between the sick cell, i.e. the peptide and the MHCI, and the T-cell. Our peptide classification model illustrates how deep learning is being applied to increase our understanding of the molecular interactions governing the activation of the T-cells.